It's been cold the last few days, at least by local standards. The temperatures has been down in the low 20s towards sea level, and much colder up on Hurricane Ridge. But, today the cold snap seems to have broken, and the sky is full of milky clouds. We went out to stretch our legs on the Lake Angeles Trail, though we had no intention of climbing 2400' to the lake. The trail itself was hard and dry. We haven't had any rain lately, but the ground seems both friable and frozen. 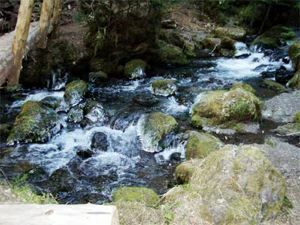 We dodged a few fallen trees and some black ice along the way to the rude bridge that arches the stream up at the first campground. We were rewarded with a great view of ice and moving water. It's a bit hard to tell the white ice hanging from the rocks and logs from the whiteness of the running water, but if you look carefully, you can see the icicles hanging from the log, that used to be the old bridge, in the lower picture, and you can see the ice patches clinging to the mossy rocks and looking much like ctenaphores in the upper one. There were lots of people out checking out the trail. We aren't sure if any of them made it all the way up to Lake Angeles. 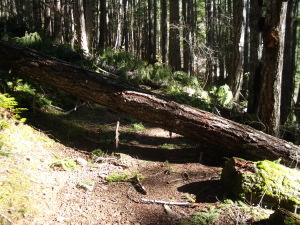 We know that there is a fallen tree that fills most of the trough of the trail up around 900' above the parking lot, but you can walk alongside it if you watch your footing. Eventually, we'll make our way up to the high country, but the cold, and particularly our fear of ice, have been holding us back. We don't stop hiking in the national park just because it is winter. True, we need to snowshoe up in the high country, and a lot of the high country roads are closed, but there is still some beautiful hiking down below. Even the recent winds and rains haven't kept us from the Spruce Railroad Trail along the north shore of Lake Crescent or from the Elwha River trail from Whiskey Bend towards Lilian Camp. There was a recent wind storm that caused a lot of damage, though it was much worse in Seattle and the Puget Sound area. We could even see this on the weather map, which showed the wind speeds in Port Angeles as about a half to two thirds of the wind speeds in areas not sheltered by the mountains. If you fly in a small plane, you will often feel the strong winds starting as you fly over Discovery Bay, and out of the shelter of the Olympics. Still, our internet service was down for most of a day, and the Whiskey Bend Road was closed while the Park Service cleared the fallen trees and brush. Whiskey Bend Road is an interesting drive under the best of circumstances. About a lane and half wide, hard packed, but unpaved, it twists and turns and climbs along the ridge to the east of Lake Mills. There was a fair bit of freshly sawn timber by the roadside, but the road was quite passable in our Honda Civic. 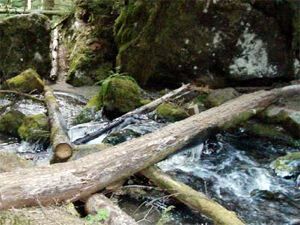 There were a few trees down along the trail, and a fair bit of water in the little side creeks, but the trail was open and the views of the Elwha River and the surrounding hills as gorgeous as ever. 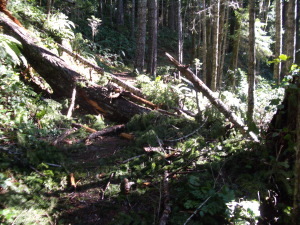 As for the Spruce Railroad Trail, the much disputed roads in the area seem to be open, though there were a good number of downed trees along the roadside, and a bit of brush on the road. Lake Crescent is high, but the water has been going down lately during this drier spell, so it is just one short step over water to get on the Devil's Punchbowl bridge. Our special surprise waterfall has dried up, but a number of other channels that are usually dry are now full of running water. In other words, the roads are opena nd the trails are open, so take advantage of the sunny days of February. Maybe that's a bit dramatic for a headline, but Ballard has always been somewhere in the wilds of Seattle, as yet unexplored. We now know a bit more about Ballard, and a lot more about an excellent, elegant restaurant where France meets the Pacific Northwest.